There are so many fun things to do with your dog these days – whether competitive or just spending time with your dog. At DogSense we specialize in several different competitive dog sports….but realize there are benefits beyond earning ribbons for participating in these sports – even if you never enter a trial. So know you will never be forced or shamed into entering your dog in a trial. Dog Shows are not for everyone…but the following dog sports are for anyone who wants to have a good time training with your dog. Your dog will become more athletic, more focused, & more responsive to you. You will become a more competent trainer, develop a stronger bond with your dog, & make new friends that share your passion. Rally is a great sport to practice all the basics of a well-trained dog – especially polite leash walking. 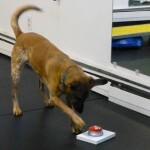 Improve your cue system, get fast responses from your dog, and improve your relationship with your dog. How much fun can you have with your dog? With six different training divisions you and your dog are guaranteed to challenge your training skills. Teach your dog how to navigate an obstacle course, perform tricks by your side, find the correct scent, push a yoga ball through a course, run an agility course, and perform a course in the water. Do one division or all six – this venue was designed with the family dog owner in mind. Wag It Games is for anyone who wants to have more fun with their dog. 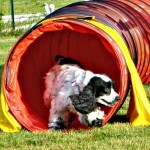 Agility is probably the most addictive dog sport I know of. It’s technical and challenging, but always done with fun and fairness for the dog. 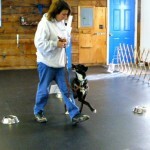 Agility training will increase your dog’s confidence and responsiveness to you, while he is having a good time. This a both a mental and a physical game for both dog and handler. “Just for Fun” Agility is geared towards the more casual handler or for those who are just curious what the sport is about. I am feeling much more optimistic after meeting with you.